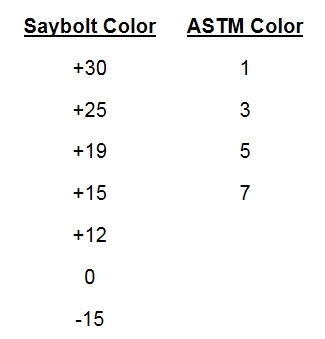 List of available liquid Saybolt and ASTM D1500 Color standards for performance verification. Spectrum Quality Standards is a small company that primarily makes GC and Physical Properties standards for the petroleum industry. Spectrum Quality also sells liquid Saybolt and ASTM D1500 color standards as defined in Appendix X1 of ASTM D6045. You can buy a set if you want to check the entire range in each scale, or if your product purchase specification must be less than a maximum Saybolt or ASTM D1500 value, you could purchase an individual liquid standard at that level to monitor and document measurement performance over time.